A while back I suggested a topic for Strawberry Singh’s weekly meme at her blog. With many of us using third party viewers and with all of the different adjustment possible, especially with Firestorm, it should be interesting to share how we see the world, how we arrange our viewers. Strawberry posted the suggestion at her blog. I captured this with the Windows snipping tool. The Lindens explain – in advance – what they will be doing in the following year. They warn us that some of the changes they are working on will cause some upset, but it is worth it in the long run – and explain why! They hold weekly meetings where they discuss the progress they are making, including the problems they have encountered. And (this is almost beyond belief) they Listen. It has gotten so bad that residents are turning on each other! Incidents of griefing have reached a new height in frequency and sophistication. Even there, the Lindens are actively working on the technical steps they can take and explain why the simple steps that might seem obvious are either difficult to implement or would be unfair to other residents. The Firestorm all volunteer development and support teams had to resort to a special blog post in response to the wackadoodles harassing the support groups. What is a blogger to do? Many have resorted to travelogs or fashion reviews. Some are blogging fiction or turning their attention to RL subject. It is enough to make me nostalgic for the Good-Old-Days. As Inara points out, and Jessica makes clear, there are rules. If you can’t abide by them please wait a few days for the official release! The Firestorm team have announced the re-opening of their Second Life release preview group, for those who are interested in assisting the team with identifying potential issues / bugs with new releases of the Firestorm viewer. I visited the new Phoenix Firestorm Support island yesterday. I am impressed! I am reminded of the old Welcome Island from 2006; there is a path from the landing point with signs and a few playful challenges. There’s no beach ball but there is a fence to jump over and a kind of a tunnel to fly through. The central island has a live helper. Several existing help groups will be assisting Phoenix/Firestorm support personnel. They are still finishing things up and are open to suggestions so of course I had a couple of minor nits to pick 🙂 – – Say “region” or “region (sim)” not just “sim”. Just because we get lazy and use the wrong word is no excuse for not teaching newbies the right way. 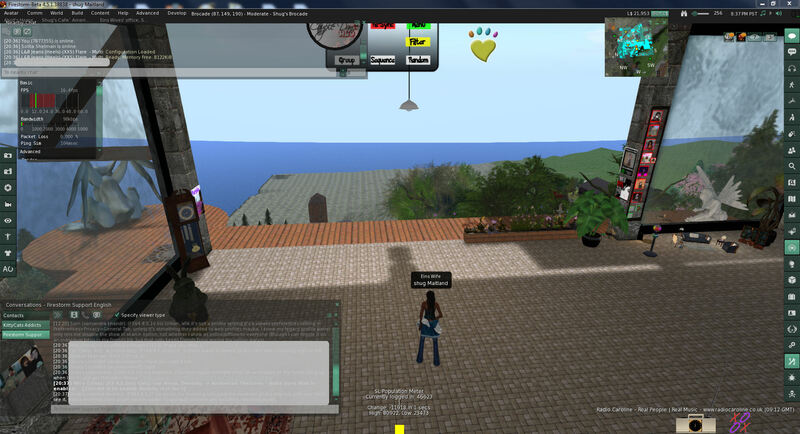 – – We can no longer say “everything is built in world” mesh and most sculpties are made outside SL. It looked to me like it would work for someone on the LL default viewer and if it serves as a gentle promotion for Firestorm so much the better. This is a big step in the right direction. I will be sending newbies there. You should visit, add your 2 cents worth before they finish. Take a moment and talk to the Phoenix then stop at the center island with some encouraging words. I hope they soon have a standard notecard and LM giver that we can put out pointing newbies there when we are off line. The new Destination Islands: obviously a work in progress. Even LL is not foolish enough to think dumping newbies in world randomly is good for retention. Time will tell. Premium Wilderness: – – – yawn – – – The Moles do good work but by it’s very nature the DPW implements what “the boss” says. A fine example of what happens without the personal, emotional investment of resident builds. We can hope that some Lindens got their hands dirty and learned some building skills in the process here. Pathfinding and the other tools LL developed for Linden Realms (created to demo and test those tools): These are working their way through the shakeout process toward full implementation, it will probably be next year before they really impact SL. Mesh: I am seeing more and more mesh builds for sale but this will not reach it’s full potential until the parametric deformer is fully adapted and we can have mesh clothing that fits properly. Direct Delivery: Rolled out to the grid in a stripped down basic form. Even so it is buggy! If anyone is surprised by that you need to check your meds. New Phoenix/Firestorm update: The highlight of my month; very efficient, TONs of features, lots of ways to customize your user interface. Be prepared to spend some time setting it up to your liking, this is not plug-and-play! So you see, for me this has been an interlude of sitting back and watching the passing parade, trying not to be drawn into the drama and overreaction of the moment.